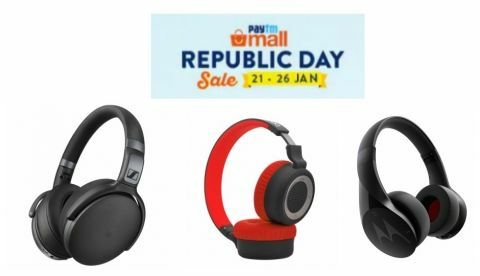 The Paytm Mall Republic Day sale is now on its second last day. The sale will end tomorrow by midnight. Let's take a look at the best headphone deals of day 5. If you didn’t get time to take most out of Amazon and Flipkart sale then this might be your last chance to grab the best deals from Paytm Mall. The Paytm Mall Republic Day sale is still going on and will run till tomorrow midnight. The sale is featuring discounts on a wide range of gadgets. Besides that, the e-commerce platform has also partnered with American Express and is offering 10% additional discount on using certain debit or credit cards. So, let’s begin. The Motorola Pulse Escape is a waterproof and dustproof wireless over-the-ear headphone that comes with a built-in microphone and a noise isolation feature. The controls to manage volume and tracks are placed on the earcup. During the sale, you would able to grab this wireless device for Rs 1,997 down from its MRP of Rs 6,499. Check out the deal here. The Sony MDR BT on-ear Bluetooth Headset features a swivel-ear cup design that lets you store headphones easily anywhere. The headphones offer a battery life of up to 30 hours. During the sale, the headphones are available at a discounted price of Rs 5,470 (including cash back) down from its MRP of Rs 7,470. Check out the deal here. The TAGG Sports Plus Bluetooth Earphones packs 120mAh battery that offers a battery life of up to eight hours. During the sale, it can be bought at Rs 3,149 (including cash back) down from its MRP of Rs 5,999. Check out the deal here. The Sennheiser HD 4.40 is an over-the-ear Bluetooth headphone, which comes with a noise canceling function. The headphones are available on the sale for Rs 6,741. Check out the deal here. The boAt Rockerz 430 is an on-ear Bluetooth headphone that comes with a noise reduction feature, which reduces ambient noise for a better listening experience. The headphones are available at Rs 1,799 during the sale. Check out the deal here.